Red River Rally - Bluegrass Cycling Club, Inc. The 50th Annual Red River Rally is on Oct 5 & 6, 2019. Join us for Kentucky's oldest continuously organized bicycle ride. Since 1970 the Bluegrass Cycling Club has hosted the Red River Rally. We welcome you to take part in out 49th ride through the Red River Gorge. Join us in our annual celebration of the fall season! We invite you ride back in time as you climb the old logging road to the hundred plus year old historic 900-foot long Nada Tunnel, enter into the valley of the Red River Gorge where you will roll through towering cliffs and massive boulders formed seven million years ago, ride past wonders of nature Raven Rock, Chimney Top Rock and Tower Rock, as you climb your way up to Sky Bridge for a snack. Ride the ridges of Pine Ridge, past Parched Corn Creek and Zachariah.Finish the 38 mile hilly loop back at Natural Bridge or continue on to Lee County and into the charming town of Beattyville and back for the 65 mile loop. Registration begins at 8:30 a.m. at shelter #2 by the sky-lift parking lot at the Natural Bridge State Resort Park, Slade, Kentucky. Wheels roll at 10:00 AM. Come and join our Sunday ride. You have four great routes to choose from: 34, 42, 43 & 50 miles. The 34 & 42 mile routes are rolling and scenic with a few climbs, while the 43 & 50 mile routes are more challenging with a number of tougher climbs that take you to Furnace KY in Estill County! The 42 and 50 mile routes will have riders pedaling through Clay City KY, before crossing the Red River and rolling back up the valley. Registration begins at 8:30am at shelter #2 by the sky-lift parking lot at the Natural Bridge State Resort Park, Slade, Kentucky. Wheels roll at 10:00am. Registration covers hot beverages prior to the ride, rest stop snacks, drinks, lunch, and sag service. Get there early! Pre-Registration will open Monday August 27, 2018. Aug 27-Oct 03, 2018 - $37.10 ($35.00 plus $2.10 KY Sales Tax) for Saturday, $37.10 ($35.00 plus $2.10 KY Sales Tax) for Sunday, or $58.30 ($55.00 plus $3.30 KY Sales Tax) for the whole weekend. $65.00 ($61.32 plus $3.68 KY Sales Tax) for Saturday, $65.00 ($61.32 plus $3.68 KY Sales Tax) for Sunday, or $85.00 ($80.81 plus $4.82 KY Sales Tax) for the whole weekend. We will limit Saturday's ride to 120 riders. On site lunch is $15.00 per day ($14.15 plus $.85 KY Sales Tax). 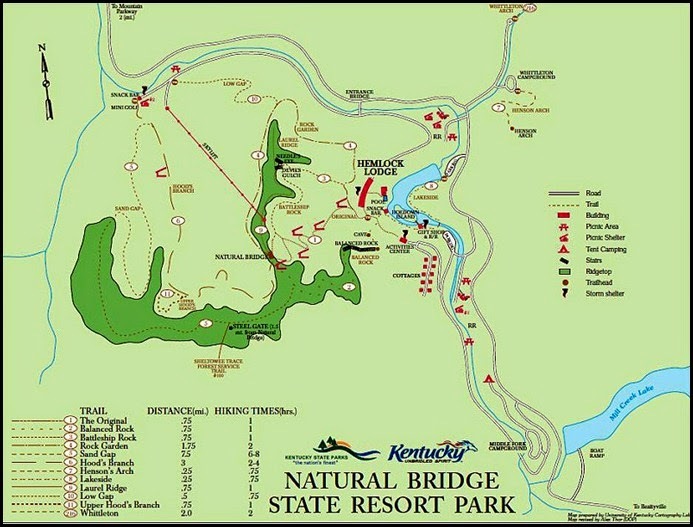 Natural Bridge State Resort Park, Slade, KY - Check In opens at 6:00pm, closes at 8:00pm. Natural Bridge State Resort Park, Slade, KY - Check In opens at 8:00am, closes at 9:45am, wheels roll at 10am. When you arrive for registration on Saturday, we will have some light breakfast foods. Once you hit the road, we will have a rest stop with water, energy drinks, and snacks at the top of the Sky Bridge climb, 17 miles into the route. We will also have a stocked rest stop in Beattyville for those choosing to do the longer route. Following the ride we will have a cookout at the sky lift picnic shelter from 1:00 p.m. until the last riders get in from the 65-mile loop. Non-riding family members can join us for the cook-out for a small additional fee. All the routes will have a rest stop in Stanton, KY with water, energy drinks, and snacks. When you return to the park on Sunday, you will be welcomed by the smell of some great food on the grill. We will have lunch, drinks, and dessert waiting for you. Non-riding family members can join us for the cook-out for a small additional fee. All riders are expected to have bicycles in good condition, to obey all traffic laws, and to ride safely and intelligently. Roads are narrow with short sight distances. These are public roads, so cars will be sharing the road with us. All riders MUST walk their bikes through Nada Tunnel. Due to the type of roads on this ride, the use of Aerobars is discouraged. Aerobars are not to be used when riding within a group. All riders must wear an SPSC or SNELL approved hard shell helmet. A headlight or flashlight is necessary in Nada Tunnel. All riders MUST walk their bikes through Nada Tunnel. The road surface is wet and dangerous. A cool, wet morning and a mild afternoon are usual, but not promised. The rally will go rain or shine. Dress appropriately in layers. Tent camping is available at the State Park (888-459-7275) or at Koomer Ridge Campground on a 'first come first served' basis. No reservations are taken for the Koomer Ridge campground. The state park rooms and local cabin rentals are generally booked months in advance, so don't delay. From Lexington take I-64 east to exit 98, Bert T Combs Mountain Parkway. Follow the parkway approximately 33 miles to the Slade exit (KY 15). Follow the signs to Natural Bridge State Resort Park (KY 11). From Ashland take I-64 west to exit 96B, turn left, cross over the overpass, turn left and merge onto I64 east. Continue on I-64 east to exit 98, Bert T Combs Mountain Parkway. Follow the parkway approximately 33 miles to the Slade exit (KY 15). Follow the signs to Natural Bridge State Resort Park (KY 11). Once you arrive at Natural Bridge Start Resort Park, turn right to enter the park and cross the bridge. Once you cross the bridge, turn right at the stop sign. Follow this road to Shelter #2. DO NOT PARK ON THE CHAIRLIFT SIDE OF THE PARKING LOT. A hilly 38 mile loop with one major climb or a hilly 65 mile loop with several major climbs. (Check out the slightly scary route profiles below.) Riders on 65 mile loop must be at the 26 mile checkpoint by 12:00 p.m. Descents can be wet and slippery, especially after Nada Tunnel. All riders MUST walk their bikes through Nada Tunnel.